For nearly a decade our dockXtender has been the premier dock extension cable for iPods, iPads, & iPhones. Starting with 30-Pin and now Lightning devices, we’ve helped tens of thousands keep their case on and get extra length while connecting to all their favorite docks and accessories. Today, we’re proud to introduce the next generation of dock extension cable: dockXtender Premium. We want everyone to get their hands on our new Premium dock extension solution, which is why we’re offering a special product launch coupon code good for 20% off the new dockXtender Premium. We’ve been the leaders in dock extension solutions for a decade now, and we hope you find the dockXtender Premium to be our best yet. Thanks as always for your incredible support! Christmas is almost here, so get your last-minute gift orders in ASAP! Our Holiday Shipping Guide is here to help you select the right shipping method for your order, so you can make sure your dockXtender, dockStubz, HeroDock, PowerPortz, or other great CableJive gift makes it in time to go under the tree. And incase you missed it, we’re running our biggest sale ever right now. Save on over 80% of our products, some with absolutely huge discounts! We’ve slashed some prices even more within the last week, so head over to our “Sale” section and act now before it’s too late. We wish you all the happiest of holiday seasons! The rumors were true! The iPhone 7 does not have a traditional headphone port. Love it or hate it, many people will be adjusting to this new reality soon. If you’re one of those people, your iPhone’s Lightning connection is more important than ever before. Don’t worry, our hit dockStubz & dockXtender adapters are here to help! No Port? No Problem! You’re probably getting a case for your new iPhone, and you don’t want to have to take it off every time you connect your favorite headphones. Our dockStubz for Lightning case adapter will help with that! Or maybe you want to give your new Lightning headphones (or headphone adapter) a little more length? Our dockXtender for Lightning cables are available in 2 foot & 6 foot options, giving you the extra reach you need. Both adapters use CableJive’s specially designed male connectors that are compatible with nearly every case available, letting you keep your case on when you connect to any Lightning headphones, chargers, docks, or other accessories. Thousands of our customers already know how helpful the dockStubz & dockXtender can be, and we’d love to show even more of you. That’s why we’re offering 25% off our dockStubz & dockXtender products right now! The dockXtender & dockStubz are more useful now than ever before. We hope you find them as invaluable as we do. Thanks as always for your incredible support of our products and company. We couldn’t do this without you! CableJive’s Summer Sale 2016 Is Here! Summer is here, and with it comes the CableJive Summer Sale! Get 20% off everything we sell at www.cablejive.com, plus FREE Standard Shipping for our US-based customers. Save big right now on everything we offer. It’s the time of year to get outdoors, so check out our hit dockStubz or dockXtender and keep your protective case on while you connect to all your accessories. Pick up a HeroDock and give your favorite device a home. Get an extra long or extra short sync & charge cable for your travels with big discounts on our iBoltz XL & XS cables. Grab an XLR microphone and record high quality audio on-the-go with the ProJive XLR. Or check out any of the other great accessories we offer. We’ve also added new items to our “Sale” section, so be sure to check those out here. We are nothing without our customers, so thank you all for the continued support! We can’t wait to share another awesome summer with you! CableJive’s 2016 Spring Sale Going On Now! Spring is right around the corner, and we’re so excited, we decided to get the party started a little early. So celebrate with us by taking 15% off everything we sell at www.cablejive.com, plus FREE Standard Shipping for our US-based customers. Save now on all our hit products. Give your smartphone or tablet a place to call home with HeroDock. Enjoy the warming weather outdoors with your favorite device and keep your protective case on while you connect to all your favorite accessories with dockStubz or dockXtender. Grab an XLR mic and record wherever your travels take you with the ProJive XLR. Or check out any of the other great accessories we offer. And if you’re looking for a super handy extra long or extra short sync and charge cable then there’s never been a better time. We’re running a huge sale on our iBoltz XL & XS cables, so get ’em while the gettin’s good. We’ve got tons of other great products that we’ve added to our “Sale” section, and you can see them all here. 6 foot dockXtender for Lightning Cables In Stock Now! Ever since we first launched the 2 foot dockXtender for Lightning cable back in December, we’ve had people asking us if and when a 6 foot version would be coming. After all, we’ve been selling 2 foot and 6 foot lengths of our 30-Pin dockXtender cables for a long time now, and there are definitely many use-cases where the extra length is needed. Thankfully (and most importantly thanks to our customers! ), the 2 foot version has been a hit, so by popular demand we had to deliver to those desperate for extra length. Which is why we’re happy to announce that the 6 foot version of our dockXtender for Lightning cable has arrived and is available right now! Plus, both this new 6 ft version and the 2 ft length dockXtender cables come with an improved male connector, which is both smaller (works with even more cases) and more durable. So whether you’ve been waiting on the 6 foot version, or thinking of getting another one, there’s never been a better time to checkout our dockXtender Premium extension cables. 6 foot dockXtender for Lightning retails for $32.95 and is available now on CableJive.com & Amazon. 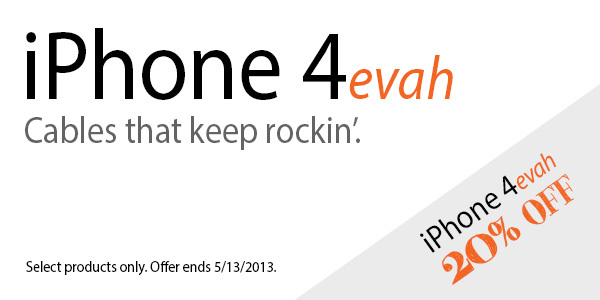 iPhone 4evah Sale Going On Now! Hot on the heels of introducing the first-ever Lightning connector cable to CableJive, the Lightlinez XS by Kenbug, we’re also remembering that most of the iPhones, iPads, and iPods in use today are unable to take advantage of these new connector accessories. We got our start working with the 30-pin connector, and this week we’re getting back in touch with our roots. Starting today, we’re giving everyone the option to save 20% off all our 30-pin iPhone, iPad, & iPod accessories, including some of our all-time most popular products like the dockXtender, dockStubz, xlSync, & more! To get the deal, simply add any of the products you want that are found on our special “iPhone 4evah” page into your shopping cart, then click the banner at the bottom of the cart page before you checkout to apply your discount code. Whether you just scored an iPhone 4 or 4S on the cheap, or you upgraded already but you know a few people who haven’t yet, it’s never been cheaper or easier to score some of the best 30-pin accessories ever.